In Estonia the EU Structural Funds are combined with the funds from CEB to form a fund for housing refurbishment and offer a long time low interest loan for apartment buildings to achieve energy efficiency. The aim of the renovation loan is to support the renovation of apartment buildings and to raise their energy efficiency at least by 20%, by improving the accessibility of loan capital through KredEx. The product is targeted to the apartment associations, building associations (incl. previous housing associations) and communities of apartment owners. 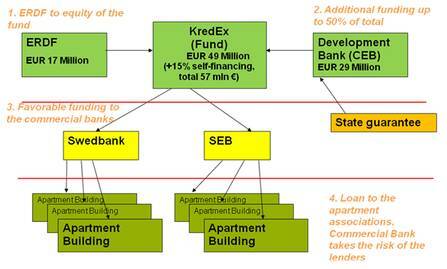 Favourable conditions of renovation loans arise from the combination of zero interest means for renovation of apartment buildings, allocated by European Union structural funds, with outside financing, enabling to offer to credit institutions financial resources with weighted average price lower than at financial markets, and to issue through these loans with lower interest and longer time limit to credit institutions. With the loans only finance of energy efficiency investments are allowed. Energy audit is obligatory in order to obtain loans, as the loans can only be allocated to investments that are covered by the energy audit. Another main objective of energy audit is to estimate energy savings that will be achieved by renovation works. In first 6 months 60 loans in total amount of 70 million € have been signed. Average size of the building is 2 425 m² with 36 apartments, average savings expected is 33%, average maturity is 13 years (maximum can be 20).